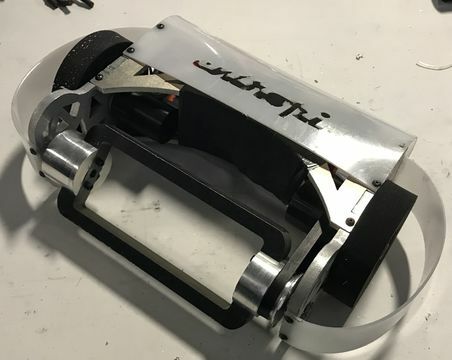 Entropi is a 3lb beater bar battlebot, first of its kind constructed for Robojackets. It is designed around an aluminum chassis, steel weapon, and high density polyethylene armor. The image to the right is before the "combat ready" ugly modifications. short fight, match was surrendered by Crispi to be able to salvage the electronics from Crispi. This was after they lost total control of their bot. Scrambler is a beater bar built from a kit, with ABS armor, aluminum beater bar with steel teeth. Both bots got one good hit in and both belts walked off the pulley forcing a pushing contest for the remainder of the fight. Good hits were exchanged initially with both bots taking damage. Eventually Event Horizon got a good hit by hooking the side plate and ripped the beater bar out of it's socket. rear plastic armor allowed robot to not become trapped on a flat surface without wheel coverage. This page was last edited on 4 April 2019, at 19:31.